Alison (Ruth Wilson) and Noah (Dominic West) had an affair while married to Cole (Joshua Jackson) and Helen (Maura Tierney), respectively. 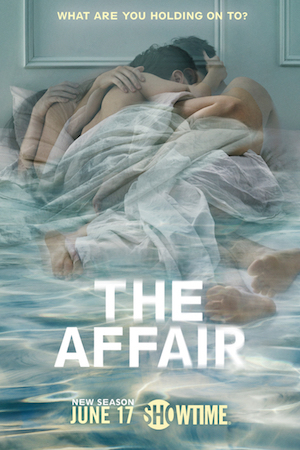 Showtime’s Golden Globe-winning series The Affair is a fascinating study of the emotional and psychological effects of an affair that shatters two marriages and the crime that keeps the star-crossed quartet intertwined. In Season 3, after spending three years in prison for the crime he didn’t commit, Noah finally revealed his true identity with a question to his therapist, “Can a cheater be a great accomplished man at the same time?” What a narcissistic, insecure man-child he is! The Affair Season 4, which returns Sunday, June 17, embodies the phrase “out of the frying pan into the fire.” The four characters are all involved in new relationships, yet it’s business as usual in the new normal. More than six years have passed and their unexamined past rear its ugly head. Helen doesn’t bend, accommodate, or meet halfway when it comes to co-parenting with Noah who followed the two younger children across the country. He was incarcerated to protect the mother of his children, but she just can’t forgive him for leaving her! How dare her ‘safe choice’ betray and abandon her!!! Never mind she lives very comfortably with Dr. Vic Ullah (Omar Metwally) in a beautiful house. While Noah & Helen carry on their dumper-dumpee drama in sunny Los Angeles, Alison and Cole stay put in Montauk. Alison, still in a victim mentality, is the embodiment of insanity; she does the same thing over and over again and expects different outcomes. And she works as a peer-to-peer counselor!? Seriously? Haven’t you heard of a self-fulfilling prophecy? What I fear, I create? Cole might be the only one who is aware of his baggage he has brought into his marriage with Luisa (Catalina Sandino Moreno), but he just can’t let go of Alison. In other words, they haven’t learned a thing from the trials and tribulations of divorce and other trauma. Divorce is not for the faint of heart, especially if kids are involved. There is no time to grieve or work on yourself, period. Although Helen sees a West Coast therapist and scans her body to read her feelings, healing/forgiveness/enlightenment might be the last thing on her mind. She claims that she has put the past behind her, but is in total denial of her own baggage and demons. The lifetime damage inflicted by our parents (Thanks, Mom & Dad!) and the absence of positive married role models usually do a number on us. So if you don’t take time to face the pain head-on and become aware of your emotional baggage you might be bringing into your next relationship, you are doomed to end up like the star-crossed quartet you see in Season 4. “I learned from my parents’ mistakes, your mother learned from hers, just as you will learn from our mistakes. Until someone someday finally has a perfect childhood,” said Noah to Whitney (Julia Golden Telles), his oldest daughter. Really? It is more than likely that Whitney as well as her younger siblings will continue the dysfunctional legacy; the damage is already done until somebody decide to break the vicious cycle. Nobody will ever have a ‘perfect childhood.’ You’ve got to grow up, Noah! It’s what you do with the time that counts. Healing doesn’t just happen; you have to make it happen. The Affair returns Sunday, June 17, on Showtime.